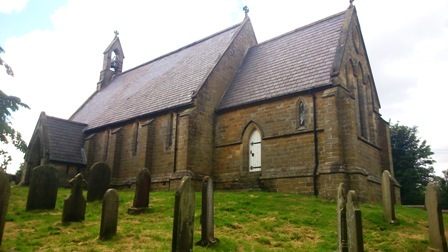 Laverton and Dallowgill were part of Kirkby Malzeard parish until St. Peter’s Church was built and consecrated in 1842. (Church consecrated 17th October 1843: taken from The Vicarage Timeline) The adjoining farm was donated by Mrs Elizabeth Lawrence of Studley Estate as glebe land and the farmhouse became the vicarage. The first incumbent was the Rev. Henry Prior whose stipend was £100. The vicarage and glebe land were sold to Leeds City Council in 1908 under a waterworks compulsory purchase order and the price paid for 68 acres, 1 rood, and 32 perches was £2410-17s. The parishes of Kirkby Malzeard and Laverton with Dallowgill were united in 1922 and the Dallowgill vicar moved to Kirkby Malzeard. There was much controversy at the time as the local people felt very strongly about losing their vicar and had sent petitions containing 150 signatures to the Lord Bishop, His Majesty King George V and the Lord Chamberlain. An acknowledgement of the receipt of the petition sent to the King was sent from Buckingham Palace to John Pearson of Wakehill. The Chapelry district of Dallowgill included the township of Laverton and the hamlet of Carlesmoor. Confirmations had always been at Ripon Cathedral or at Masham Church, but in 1941 there were so many young people attending the confirmation class that the Rev. H E Horton persuaded the Bishop of Ripon to perform the ceremony at Dallowgill. Extract from the London Gazette. Published by Authority. Tuesday July 23rd, 1844. Whereas John William Pearson of Dallowgill in the Township of Laverton in the West Riding of the County of York, farmer, was on the tenth day of April instant duly nominated and elected by the inhabitants of the said Township of Laverton then and there in Vestry assembled to be Assistant Overseer of the Poor of the said Township and the said inhabitants did then and there determine and Specify the following Duties of Overseers of the Poor which by the said John William Pearson shall be executed and performed that is to say all the Duties of an Overseer of the Poor. And the said inhabitants did then and there also fix the yearly Salary of the said John William Pearson to be six pounds for his execution of the said Office to be paid to him half yearly on the 25th day of March and the 29th day of September in every year the first half yearly payment to become due and be made on the 29th day of September next. Given under our hands and seals the thirtieth day of April in the year of our Lord 1880 at Ripon in the Riding aforesaid.